Alcohol addiction is a worldwide problem. It has mainly two components: dependence and withdrawal. Characteristic properties of most anti-addictive compounds include anti-anxiety, anticonvulsant, antidepressant, and nootropic actions. Shankhpushpi (Convolvulus pluricaulis. Convolvulaceae), known ethnopharmacologically as brain tonic, possess all the properties mentioned above. Here, we screen shankhpushpi for possible anti-addictive potential. Effect of shankhpushpi churna was measured on ethanol withdrawal anxiety using elevated plus maze. The role of shankhpushpi on chronic ethanol consumption (21 days) was measured using two bottle choice protocol of voluntary drinking. We also measured the effect of the above herb on cortico-hippocampal GABA levels. Shankhpushpi was found to reduce alcohol withdrawal anxiety in a dose-dependent manner. The herb also decreased ethanol intake and increased water intake significantly (P < 0.001) after 4 days of administration. Both these effects were blocked (P < 0.001) by GABAA antagonist suggesting the role of GABAA receptor. Chronic administration of shankhpushpi also significantly (P < 0.01) increased cortico-hippocampal GABA levels in mice. Shankhpushpi reduced both alcohol dependence and withdrawal in a GABAA-dependent manner, thus showing anti-addictive potential. 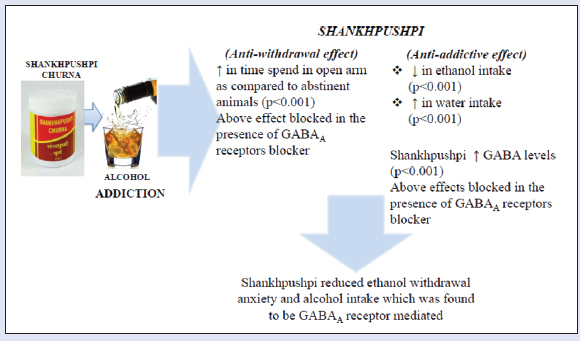 Shankhpushpi prevented ethanol withdrawal anxiety and alcohol addiction in a GABAA-dependent manner. Alcohol addiction is a worldwide problem. Alcohol consumption accounts for more than 3.3 and is the fifth leading risk factor for premature death and disability. Alcohol contributes various diseases and injury-related health conditions, most notably alcohol dependence, liver cirrhosis, cancers, HIV, and injuries, primarily road traffic accidents., Alcohol dependence is a complex and dynamic process involving various neurobiologic and environmental factors. Individual's propensity to alcohol consumption is primarily a balance between alcohol's rewarding effects and its withdrawal consequences. One factor contributing to relapse is withdrawal related anxiety, which likely reflects adaptive changes in the brain in response to continued alcohol exposure. Association of these pleasant/unpleasant feelings with environmental clues may influence alcohol intake. Alcohol withdrawal symptoms include irritability, agitation, anxiety, sleep disturbances, and reduced pain threshold both in human and animals. Disulfiram, naltrexone, and acamprosate are US Food and Drug Administration (US-FDA) approved medications for treatment of alcohol dependence. However, they have various side effects including palpitation, flushing, nausea, vomiting, headache, anxiety, sedation, and transient diarrhea, which affect the quality of life of the addicted individual under anti-addictive therapy. Herbal medicines can be used for the development of new therapeutically active compounds with higher potency and lower toxicity. Most modern drugs have a natural origin and play a major role in drug development. Shankhpushpi (Convolvulus pluricaulis Choisy) is a perennial herb referred to as morning glory. The plant is used locally in Indian and Chinese system of medicine to treat various diseases. Its different pharmacologic actions include cough suppressant, antihypertensive, antiulcer, hypolipidemic, and against various neurologic disorders. It may be used as a stress reliever, a mood stabilizer, and memory enhancer. It may also reduce peripheral nerve hyperexcitability, as well as used as an adjuvant to anticonvulsant therapy., Its primary chemical constituent includes alkaloids like shankhpushpine, convolamine, convoline, convolidine, convolvine, confoline, convosine, and so on, found in different species from this family. The fresh plant contains volatile oils, fatty acids, fatty alcohols, and hydrocarbons like myristic acid, palmitic acid, linoleic acid, and straight-chain hydrocarbons like hextriacontane. The flavonoid kampferol and steroids phytosterol, β-sitosterol have also been extracted., Many of these active constituents isolated from aerial parts of C. pluricaulisy like shankhpushpine, scopoletin, kaempferol phytosterol, and β-sitosterol have been shown to act as GABAA agonists, which could be attributed to the anxiolytic and CNS-depressant actions of shankhpushpi. Here, we report that acute administration of shankhpushpi may prevent alcohol withdrawal anxiety, whereas its chronic administration may reduce alcohol consumption in mice. 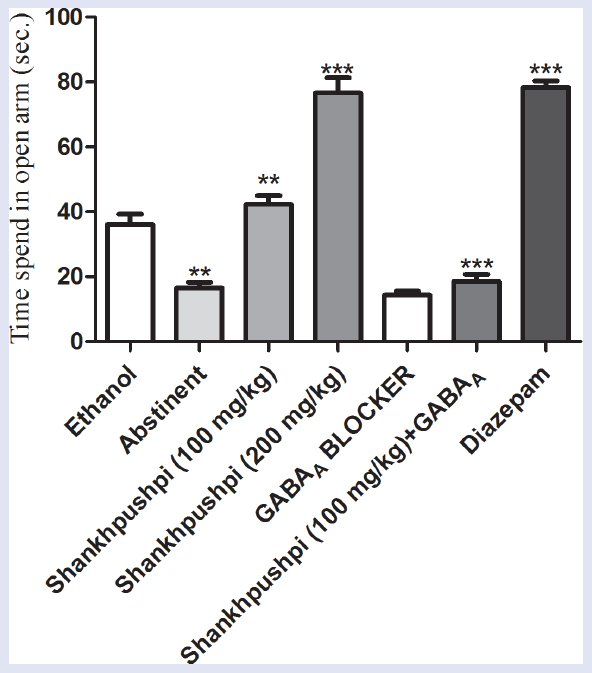 Chronic administration of shankhpushpi extract led to change in cortico-hippocampal GABA levels, whereas GABAA blocker completely reversed its anti-addictive properties. Thus, above results suggest that C. pluricaulis may prevent alcohol addiction in a GABAA-dependent manner. Swiss albino mice (20–30 g) were used in this study. Animals were issued from the Institutional Animal House (Reg. No. 621/02/AC/CPCSEA) of Birla Institute of Technology, Mesra. All animals were kept in polyacrylic cages and maintained under standard conditions (room temperature 24–27°C and humidity 60–65% with 12:12 light:dark cycles). The food was provided in the form of dry pellets and water ad libitum. The animals were allowed to get acclimatized to the laboratory conditions for 7 days before the commencement of the experiment. All experiments involving animals complied with the ethical standards of animal handling and approved by the Institutional Animal Ethics Committee (BIT/PH/IAEC/28/2013). Blood was collected by retro-orbital bleeding with animals in light ether anesthesia after 20 min of ethanol administration. Ethanol levels were measured using ultraviolet (UV) assay kit for alcohol estimation based on manufacturer's protocol (Thermo Fisher Scientific (India) Pvt. Ltd). The conditioned place preference (CPP) apparatus contain three compartments. The two end compartments (30.5 cm × 26.5 cm × 37 cm) were connected by a central corridor (12.75 cm × 23 cm × 15.25 cm). The compartment on the left had black walls with a perforated stainless steel floor with round holes on staggered centers. The central corridor was transparent with a smooth plexiglass floor, and the right compartment had white walls with a stainless steel mesh floor. (1) Preconditioning phase: (first and second day) The animals were placed in the middle chamber and allowed to explore both the chambers for 30 min. (2) Conditioning phase: (3rd - 10th day) Each mouse was treated for eight consecutive sessions with the alternate oral administration of alcohol and saline. On days 3, 5, 7, and 9, the animals were administered ethanol (2 g/kg body weight; i.p. 10% [v/v]) and placed in one compartment for 30 min. Besides, on days 4, 6, 8, and 10, the animals were administered saline and placed in opposite compartment. (3) Postconditioning phase: (11th–12th day) Mice were placed in the middle chamber and allowed free access to both chambers for 30 min. Time spent in ethanol and saline-paired chamber was measured. The behavioral tests were performed 60 min after oral drug administration and 30 min after intraperitoneal administration. The model has been validated pharmacologically and currently considered the “gold standard” test of anxiety-related behavior. Elevated plus maze (EPM) was performed as described by Kokare et al. In summary, after drug treatment, individual mice were placed at the center of the maze, head facing an open arm. During the 5 min test period, the number of entries and time spent on the open arm were recorded automatically (Medicraft Electromedical, Lucknow, India). We used the standard two-bottle choice protocol, which is a widely used animal model to capture aspects of voluntary alcohol consumption in humans. Following 7 days of acclimatization, animals were subjected to an ethanol drinking acquisition regimen. The animals remained in their home cages at all times throughout the study but had their water bottles removed during a 4 h and ethanol presentation period. During this time, animals were exposed to a free choice between ethanol (15% v/v) and water for 20 days but with no drug pretreatment. Group 4: received free choice ethanol (15% v/v)/water and diazepam 21st–30th day. Group 5: received free choice ethanol (15% v/v)/water, GABAA antagonist and shankhpushpi 21st–30th day. After the above experimental protocol of 30 days, five animals per group were sacrificed under ether anesthesia by cervical dislocation for biochemical estimation. Brain tissue was homogenized in 5 mL of 0.01 M HCl. In this homogenate, 8 mL of ice cold ethanol was added and kept for 1 h at 0°C. The contents were centrifuged for 10 min at 16,000 rpm and supernatant was collected in a Petri dish More Details. The precipitate was washed three times with 5 mL of 75% ethanol. The washes were combined with supernatant and evaporated to dryness. To the dry mass, 1 mL water and 2 mL chloroform were added and centrifuged at 2000 rpm. Upper phase containing GABA was separated, and 10 μL of it was applied as spot on Whatman filter paper. The mobile phase consisted of n-butanol, acetic acid, and water in 4:1:5 ratios. The chamber was saturated for half an hour with mobile phase. The paper chromatogram was developed with ascending technique. The paper was dried in a hot air oven and then sprayed with 0.5% ninhydrin solution in 95% ethanol. The paper was dried. Blue spot developed on paper, which was cut and heated with 2 mL ninhydrin solution on a water bath at 60–65°C. Water was added to the solution and kept for 1 h and supernatant was used. Absorbance was measured at 570 nm on a UV-visible spectrophotometer. In CPP, the animal's choice to spend more time in either environment provides a direct measure of the conditioned reinforcing effect of a drug. Animals were found to prefer the ethanol-paired chamber over the saline-paired chamber. In our study on day 11, the ethanol-treated animals spent significantly more time in the ethanol-paired chamber as compared to the saline-paired chamber (P < 0.001). 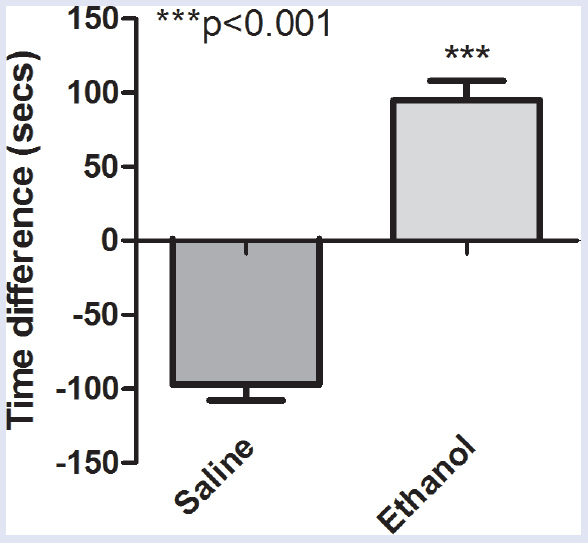 Animals spent about 66% of total time in ethanol-paired chamber versus the saline-paired. For the control group (saline-treated), the time spent in both the chambers were comparable [Figure 1]. Similar results were observed on day 12 (data not shown). The CPP results suggested that the animals got addicted to alcohol. Ethanol levels in the blood samples were found to be 47 mg/dL (n = 6). In the present study, according to the CPP model described by Thanos et al., with minor modifications, acute ethanol withdrawal anxiety was developed and measured using elevated plus maze test. Five days of abstinence followed 10 days of conditioning phase in which alternate dose of ethanol and saline was given for 10 days. After 5 days of abstinence from ethanol, animals showed a significant decrease in time spent (P < 0.01) in the open arm of the elevated plus maze as compared with the control, suggesting withdrawal anxiety. Shankhpushpi (100 and 200 mg/kg) administration led to a dose-dependent reversal of withdrawal anxiety as evidenced by significant increase in time spent in the open arm (P < 0.01). Both 200 mg/kg shankhpushpi and diazepam showed comparable anxiolytic potential against ethanol withdrawal anxiety. However, pretreatment with GABAA antagonist prevented shankhpushpi-mediated reversal of withdrawal anxiety (P < 0.001) [Figure 2]. Treatment with GABAB agonist and shankhpushpi did not show any significant change in withdrawal anxiety compared with shankhpushpi-treated animals (data not shown). The above results suggest that shankhpushpi may reverse ethanol withdrawal anxiety in a GABAA-dependent manner. Figure 2: Effect of shankhpushpi on ethanol withdrawal anxiety using elevated plus maze. Ethanol abstinence significantly decreased (P < 0.001) time spend in open arm compared with ethanol-treated animals. Shankhpushpi treatment to abstinent animals significantly (100 mg/kg, P < 0.01 and 200 mg/kg, P < 0.001) increased time spend in open arm compared with abstinent animals. Diazepam also significantly increased time spend in open arm over abstinent and ethanol-treated groups (P < 0.001). Animals treated with shankhpushpi in the presence of GABAA blocker spent significantly less time in the open arm (P < 0.001) compared with abstinent animals. After 30 days of alcohol treatment, animals showed a significant increase (P < 0.01, n = 5) in cortico-hippocampal GABA as compared with control group. Shankhpushpi (200 mg/kg) treatment (10 days) showed a significant (P < 0.01, n = 5) increase in GABA as compared with alcohol-consuming animals. This significance further increased (P < 0.001, n = 5) in diazepam-treated group as compared with alcohol group [Figure 3]. Shankhpushpi-treated animals showed a significant (P < 0.001, n = 7) decrease in ethanol and water intake as compared with the control group after day 24 or 4 days postshankhpushpi therapy. This was comparable with diazepam-treated animals, who also showed a significant decrease (P < 0.001, n = 7) in ethanol intake. However, animals' administration with GABAA blocker followed by shankhpushpi failed to show a decrease in ethanol and increase in water intake till day 30. 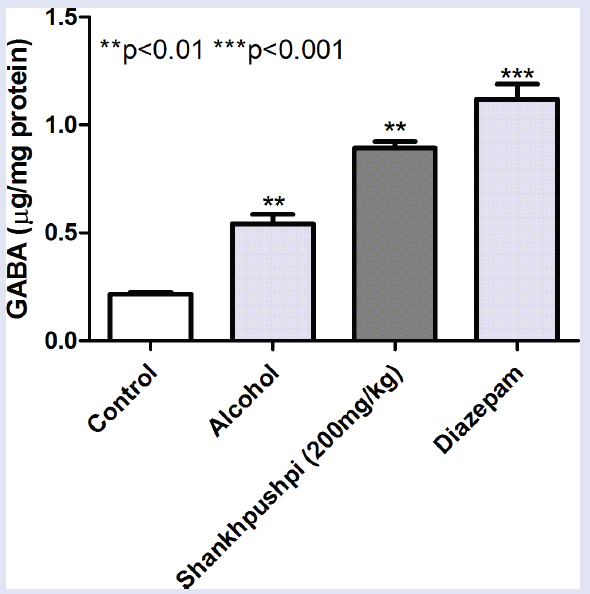 The above results suggest that shankhpushpi prevented chronic ethanol intake, which may be mediated by GABAA receptors [Figure 4]. In the present work, we study the effect of shankhpushpi in both acute alcohol withdrawal and chronic alcoholism. Addiction model used in the alcohol-withdrawal study was CPP. The CPP results suggest that when given a choice after administration of alcohol for 11 days, the animals preferred the ethanol-paired chamber to that of saline-paired chamber, thus confirming the development of addiction. Ethanol consumption followed by withdrawal results in the development of abstinence syndrome.,,,, Common and prominent feature of alcohol withdrawal is anxiety, which is also considered to be the most important negative motivation to revert to alcohol use. The above sign of ethanol withdrawal (EW) have been attributed to upregulation of NMDA receptors and downregulation of GABAA receptors. Therefore, a drug that either facilitates the action of GABA or decreases glutamate activity may be effective in EW-induced anxiety behavior. The elevated plus maze is the most commonly employed tests for assessing anxiety-like behavior after alcohol withdrawal, which is a measure of psychologic dependency. Typical anxiolytic drugs increase the proportion of entries, time spent, and rearing in the open arms. The anxiolytic potential of shankhpushpi churna and diazepam were studied on acute ethanol withdrawal anxiety using elevated plus maze. Abstinence to ethanol led to precipitation of withdrawal anxiety as revealed by the significant reduction in time spent in open arm of EPM. Shankhpushpi churna and diazepam increased the time spent in open arm, thus reducing ethanol withdrawal anxiety, one of the primary reasons for alcohol addiction. Benzodiazepines are a positive allosteric modulator of GABAA. They act by potentiating the effect of GABA on its receptor. It has been suggested that downregulation of GABAA receptor and/or decrease in the GABAergic transmission may be responsible for ethanol withdrawal. Diazepam acts by potentiating the effect of GABA at the receptor site and shows its anxiolytic property. We also found a significant increase in GABA levels upon administration of shankhpushpi churna and diazepam. 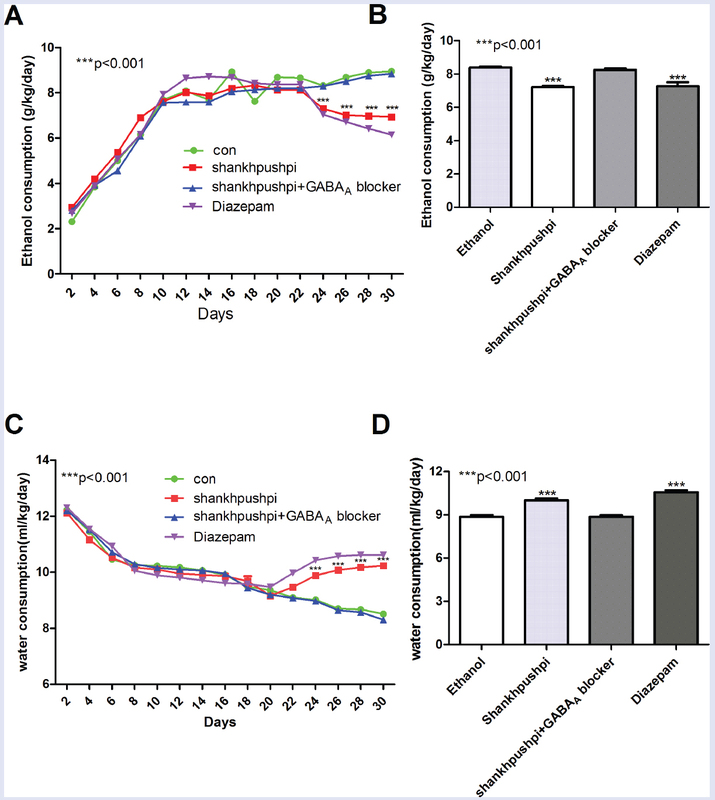 Treating animals with GABAA antagonist successfully reversed the anxiolytic property of shankhpushpi, thus pointing toward the role of GABAA receptor in shankhpushpi-mediated reduction in withdrawal anxiety. Next, we determined the effect of shankhpushpi on alcohol consumption in mice. The two-bottle choice protocol is a widely used model that captures aspects of voluntary alcohol consumption in humans. After 30 days of chronic ethanol intake, animals showed increased cortico-hippocampal levels of GABA as we reported previously. Decrease in GABAergic function after chronic administration of alcohol in experimental animals has been widely attributed to decrease in GABAA receptor expression and function. Shankhpushpi treatment significantly increased GABA levels in the cortico-hippocampal lysates over ethanol-treated animals. Diazepam, a standard anxiolytic drug also showed increased GABA levels. Others have also reported the role of GABA in anxiolytic property of aerial parts of C. pluricaulis. Alcohol is an indirect GABA agonist. Plasma and CSF level of GABA have been found to remain high after initial withdrawal than after longer periods of abstinence. Evidence showed a decrease in GABAergic function after chronic administration of alcohol in experimental animals, which has been attributed to decrease in the GABAA receptors or changes in the composition of the receptor. Hence, in the present study, we report anti-addictive potential of shankhpushpi churna in alcohol addiction in mice. It not only reversed ethanol withdrawal anxiety but also decreased chronic alcohol consumption in these animals in a GABAA receptor-dependent manner. Drug free world available at http://www.medicalnewstoday.com/info/addiction/. Accessed on 20/08/16. Drug abuse vectors available at www.vectorstock.com accessed on 20/08/16. Pallensen S, Lorvik I, Bu EH, Molde H. An exploratory study investigating the effects of treatment manual for addiction. Psychol Rep 2015;117:490-5. Nicole MA, Pedro RB, Artley GH. Evidence for sugar addiction: behavioral and neurochemical effects of intermittent, excessive sugar intake. Neurosci Biobehav Rev 2008;32:20-39. Vengeliene V, Bilbao A, Molander A. Neuropharmacology of alcohol addiction. Br J Pharmacol 2008;154:299-15. Fard MT, Arulselvan P, Karthivashan G, Adam SK, Fakurazi S. Bioactive extract from Moringa oleifera inhibits the pro-inflammatory mediators in lipopolysaccharide stimulated macrophages. Pharmacogn Mag 2015;11:(Suppl 4)S556-63. Sethiya NK, Mishra SH. Review on ethnomedicinal uses and phytopharmacology of memory boosting herb Convolvulus pluricauli Choisy. Aust J Med Herb 2010;22:19-25. Chulet R, Pradhan P. A review on rasayana. Pharmacogn Rev 2009;3:229-34. Kulkarni R, Girish KJ, Kumar A. Nootropic herbs (Medhya Rasayana) in Ayurveda: an update. Pharmacogn Rev 2012;6:147-53. Siddiqui NA, Ahmad N, Musthaq N, Chattopadhyaya I, Kumria R, Gupta S. Neuropharmacological profile of extracts of aerial parts of Convolvulus pluricaulis Choisy in mice model. Open Neurol J 2011;8:11-4. Thanos PK, Dimitrakakis ES, Rice O, Gifford A, Volkowa ND. Ethanol self-administration and ethanol conditioned place preference are reduced in mice lacking cannabinoid CB1 receptors. Behav Brain Res 2005;164:206-13. Juan CL, Laura F, Pablo B. Modulation of ethanol-induced conditioned place preference in mice by 3-amino-1,2,4-triazole and D-penicillamine depends on ethanol dose and number of conditioning trials. Psychopharmacology 2013;230:557-68. Kokare DM, Chopde CT, Subhedar NK. Participation of alpha-melanocyte stimulating hormone in ethanol-induced anxiolysis and withdrawal anxiety in rats. Neuropharmacology 2006;51:536. Li TK. Pharmacogenetics of responses to alcohol and genes that influence alcohol drinking. J Stud Alcohol 2000;61:5-12. Marcucella H. Predicting the amount of ethanol consumed per bout from schedule of access to ethanol. Anim Learn Behav 1989;17:101-2. Hall W, Zador D. The alcohol withdrawal syndrome. Lancet 1997;349:1897-900. Anton RF, Becker HC. Pharmacotherapy and pathophysiology of alcohol withdrawal. Alcohol Res Health 1997;24:315-67. Becker HC. Animal models of alcohol withdrawal. Alcohol Res Health 2000;24:105-13. Kliethermes CL. Anxiety-like behaviors following chronic ethanol exposure. Neurosci Biobehav Rev 2005;28:837. Draski L, Deitich RA. Pharmacological effects of ethanol on nervous system. Alcohol Res Health 1995;24:227-50. Hunt WA. Alcohol effect on brain. Alcohol Res Health 1993;24:559-61. NIH News ReleaseLargest ever comorbidity study reports prevalence and co-occurrence of alcohol, drug, mood and anxiety disorders. Available at https://www.niaaa.nih.gov/news-events/news-releases/largest-ever-comorbidity-study-reports-prevalence-and-co-occurrence. Accessed on 20/08/16. Davies M. The role of GABAA receptors in mediating the effects of alcohol in the central nervous system. J Psychiatry Neurosci 2003;28:263-73. Justin SR, Karyn B, John KB, Deborah AF, John CC. Evaluation of a simple model of ethanol drinking to intoxication in C57BL/6J mice. Physiol Behav 2004;84:53-63. Bansal P, Banerjee S. Effect of withania somnifera and shilajit on alcohol addiction in mice. Pharmacogn Mag 2016;12:(Suppl 2)S121-8. Julia AC, Christopher LC. GABA-A receptor modulation of the rewarding and aversive effects of ethanol. Alcohol Alcoholism 2002;26:131-43. Agarwal P, Sharma B, Fatima A, Jain SK. An update on Ayurvedic herb Convolvulus pluricaulis Choisy. Asian Pac J Trop Biomed 2014;4:245-52. Adinoff B, Kramer GL, Petty F. Levels of gamma aminobutyric acid in cerebrospinal fluid and plasma during alcohol withdrawal. Psychiatry Res 1995;59:137-44. Kumar S, Porcu P, Werner DF, Matthews DB, Diaz-Granados JL, Helfand RS, et al. The role of GABAA receptors in the acute and chronic effects of ethanol: a decade of progress. Psychopharmacology 2009;205:529. Indurwade NH, Biyani KR. Evaluation of comparative and combined depressive effect of Brahmi, Shankhpushpi and Jatamansi in mice. Indian J Med Sci 2000;54:339-41. Hetal A, Vyas HA, Harisha CR, Shukla VJ. A comparative pharmacognostic and phytochemical study of Shankhpushpi. IJRPB 2011;2:1457-60.